The M69 is a 15.7-mile (25.3 km) dual three lane dual carriageway motorway in Leicestershire and Warwickshire, England. It runs between junction 21 of the M1 near Leicester and junction 2 of the M6 near Coventry. It opened in 1977. The motorway, also known at the time as the 'Coventry – Leicester Motorway' was completed in 1977 following a public inquiry in 1972. It took traffic from the A46, which was subsequently downgraded. Starting at the northeastern suburbs of Coventry at junction 2 of the M6, the motorway crosses the Coventry Canal and then continues northeast past Bulkington and west of Wolvey before turning more easterly to run south of Hinckley (Junction 2, known locally as 'Reacharound Island' because of the limited slip roads). It then crosses the Birmingham to Peterborough railway line terminating in the vicinity of suburban Enderby and Braunstone to the south west of Leicester Junction 3, where it meets the M1 with continuation along the A5460/A563 towards Leicester. The motorway has no services given that this function is fulfilled at present by Leicester Forest East services and Corley services in close proximity to the start and end points of this relatively short motorway. There is an aspiration to construct a new slip road and road bridge for traffic travelling southbound on the M1 south to join the M69. Since the completion of the M69 motorway linking Coventry and Leicester, the motorway's number has given its name to the derby between the two football clubs playing in each city – Coventry City and Leicester City. These two clubs are rivals in the M69 derby. ^ "Motorways Programme HC Deb 4 May 1971 vol 816 cc332-5W". Hansard. Retrieved 7 January 2010. Wikimedia Commons has media related to M69 motorway. Enderby is a small town and civil parish in Leicestershire, on the southwest outskirts of the city of Leicester. The parish includes the neighbourhood of St Johns, which is east of the village separated from it by the M1 motorway, the 2011 Census recorded the parishs population as 6,314. The village is either side of the B4114 between Fosse Shopping Park and Narborough, the parish includes Fosse Shopping Park, Grove Park Commercial Centre and Everards Brewery. 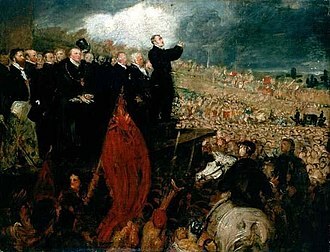 The parish is bounded by the City of Leicester and the parishes of Braunstone Town, Glen Parva, Narborough. The course of the Fosse Way Roman road passes through the parish, near St Johns is the deserted village of Alderby by the River Soar. Enderby Hall was the home of the Smith family when the paternal line ended. The hall was left to Charles Loraine who took the name Charles Loraine Smith, Enderby was in the UK Parliament constituency of Blaby between 1974 and 2010, when this was replaced with the South Leicestershire constituency. It is currently represented in the House of Commons by Alberto Costa of the Conservative Party, a disused railway line known locally as ‘Whistle Way’ is north of the village, and has since become the western edge of the Enderby and Narborough areas. This branch line used to link the now disused Enderby Warren Quarry with the Birmingham to Peterborough Line about 1⁄2 mile southwest of Narborough railway station, there was neither a passenger service nor an Enderby station. Enderby is home to Fosse Shopping Park, one of Britains biggest out-of-town shopping parks, the village centre has a newsagents, petrol station, beauty salon, library, cafe and hand car wash. It has two Co-operative Food stores within metres of each other, one owned by Central England Co-operative, Enderby has a leisure centre with swimming pool, squash courts and sports hall for badminton and 5-a-side football. There is a nine-hole pay-and-play golf course, the head office of clothing retailer Next plc is located in Enderby. Enderby is near the M1 and M69 motorways, the B4114 and B582 both run through Enderby. Rail transport is provided by the nearby Narborough railway station on the Birmingham to Peterborough Line, trains are operated by CrossCountry and provide regular services to Leicester, Hinckley and Birmingham. Rugby is a market town in Warwickshire, close to the River Avon. The town has a population of 70,628 making it the second largest town in the county, the enclosing Borough of Rugby has a population of 100,500. Rugby is 13 miles east of Coventry, on the edge of Warwickshire. The town is credited with being the birthplace of rugby football, Early Iron age settlement existed in the Rugby area, and a few miles outside what is now Rugby, existed a Roman settlement known as Tripontium. Rugby was originally a small Anglo-Saxon farming settlement, and was mentioned in the Domesday Book of 1086 as Rocheberie, Rugby obtained a charter to hold a market in 1255, and soon developed into a small country market town. Rugby School was founded in 1567 with money left in the will of Lawrence Sheriff, a locally born grocer, Rugby School was originally intended as a school for local boys, but over time became a mostly fee-paying private school. The Lawrence Sheriff School was eventually founded in the late 19th century to carry on Sheriffs original intentions, Rugby remained a sleepy country market town until the 19th century and the coming of the railways. 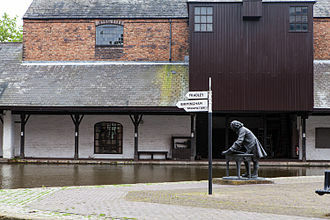 In 1838 the London and Birmingham Railway was constructed past it, Rugby became an important railway junction, and the proliferation of rail yards and workshops attracted workers. Rugbys population grew from just 2,500 in 1835, to over 10,000 by the 1880s, in the 1890s and 1900s heavy engineering industries began to set up in the town, and Rugby rapidly grew into a major industrial centre. 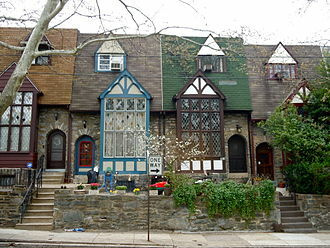 Rugby expanded rapidly in the decades of the 20th century as workers moved in. By the 1940s, the population of Rugby had grown to over 40,000, in the postwar years, Rugby became well served by the motorway network, with the M1 and M6 merging close to the town. Rugby is most famous for the invention of rugby football, which is played throughout the world, the invention of the game is credited to William Webb Ellis whilst breaking the existing rules of a football match played in 1823 at Rugby School. Rugby School is one of Englands oldest and most prestigious public schools, a substantial part of the 2004 dramatisation of the novel, starring Stephen Fry, was filmed on location at Rugby School. Coventry City Football Club is a professional football club in Coventry, West Midlands, which plays in League One, the third tier of English football. Coventry City formed as Singers F. C. in 1883 and they won their only major trophy in 1987 when they beat Tottenham Hotspur 3–2 to win the FA Cup. They are one of five clubs to have ever won the FA Cup and FA Youth Cup in the same season. They returned to Wembley in April 2017, beating Oxford United 2-1 to win the English Football League Trophy. Following eleven seasons in the second-tier Football League Championship, Coventry were relegated to Football League One in 2012, Coventry have qualified for European competitions twice. In the 1970–71 season, they competed in the European Inter-Cities Fairs Cup, despite beating Bayern Munich 2–1 in their home leg, they had lost 1–6 in the first leg in Munich to go out of the competition. They were unable to compete in the 1987–88 UEFA Cup Winners Cup due to the ban on English clubs at that time, from 1899 to 2005, Coventry City played at Highfield Road. 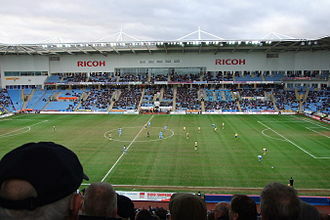 A return to the Ricoh Arena was announced on 21 August 2014 by the club after a one-year absence,1883 – The club is founded by employees of Singer, the cycle firm, with William Stanley one of the leading lights. 1898 – The clubs name is changed from Singers F. C. to Coventry City,1899 – The club move to Highfield Road following stints at Dowells Field and Stoke Road. 1901 – The club suffer their worst ever defeat with an 11–2 loss against Worcester-based Berwick Rangers in the round of the FA Cup. 1919 – The club are voted into the Football League, where they have remained ever since,1928 – In February, and with Coventry struggling near the foot of Division Three South, the clubs worst ever attendance is recorded. Only 2,059 turn up for the match against Crystal Palace,1932 – Centre-forward Clarrie Bourton heads the Football League scoring lists with 49 goals. The following season he scored 40 goals,1934 – City record their biggest ever victory a 9–0 league drubbing of Bristol City. 1936 – Coventry City win the Third Division South championship after a final day 2–1 victory over Torquay United. A dual carriageway is a class of highway with carriageways for traffic travelling in opposite directions separated by a central reservation. 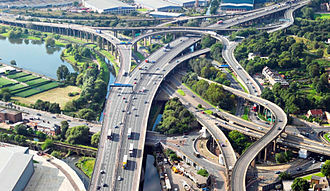 Roads with two or more carriageways which are designed to higher standards with controlled access are generally classed as motorways, freeways, a road without a central reservation is a single carriageway regardless of the number of lanes. Dual carriageways have improved road traffic safety over single carriageways and typically have speed limits as a result. 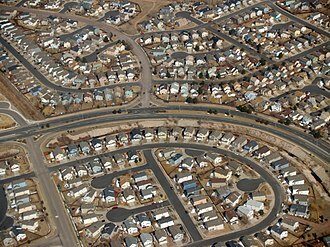 In some places, express lanes and local/collector lanes are used within a system to provide more capacity. A very early example of a dual carriageway was the Via Portuensis, in 1907 the Long Island Motor Parkway opened, and roughly 20% of it featured a semi-dual-carriageway design. The New York City Belt Parkway system, which was built between 1907 and 1934, pioneered the same design, however the majority of it featured concrete or brick railings as lane dividers instead of grass medians. In 1924 the first Italian autostrada was opened running 55 km from Milan to Varese and it featured a broad road bed and did not feature lane dividers except near cities and through the mountains. The London end of the Great West Road became Britains first dual carriageway when it was opened in 1925 by King George V, in 1927 the Rome bypass was opened. It ran 92 km bypassing Rome to the east, almost the entire length featured a dual-carriageway design. In the early 1930s it was extended all the way to Naples. Most of the routing was destroyed by the Allies in the World War II. 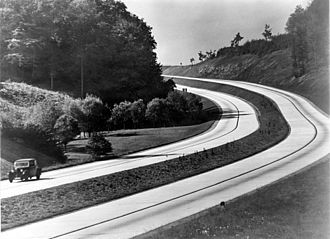 By 1930 several US and European cities had built dual-carriageway highways, in 1932 the first German autobahn opened between Cologne and Bonn. It ran 21 km and became a precedent for future highways, although it, like the first autostrada, did not feature a dual-carriageway design, it inspired the mass construction of future high-speed roadways. During the 1930s, Germany and the Soviet Union began construction of a network of dual carriageway expressways. By 1942, Germany had over 3,200 km of dual carriageway roads, Italy had nearly 1,300 km, opened to traffic in 1940, the 160-mile-long Pennsylvania Turnpike was the first rural dual carriageway built in the United States. The M69 Derby is a football match played between Coventry City and Leicester City. It takes its name from the motorway connects the two cities, which are only 24 miles apart. According to a survey by The Football Pools published in 2008, the derby has on occasion been marred by violence, the most recent in February 2008. Prior to that, another place in Coventry in October 2004 where police officers were pelted with missiles. The first fixture between the two clubs was a Second Division game on 27 September 1919 and resulted in a 1–0 win for Leicester, the biggest victory resulted in an 8–1 to Leicester in the League Cup at Highfield Road on 4 December 1964. 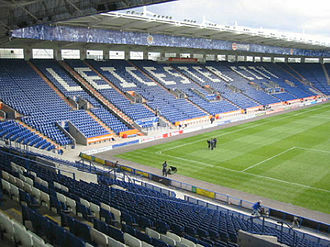 Coventry have been beaten on two other occasions at Filbert Street, with both matches ending in a 5–1 win for Leicester. The first was in 1924–25, when Arthur Chandler scored a hat-trick, and in 1984–85, while Leicester is undefeated on their current home turf, this ended for Coventry when they lost 1-0 at the Ricoh Arena on 6 August 2011. The vast majority of motorway services in the UK are owned by one of three companies, Welcome Break and Roadchef. Smaller operators include Extra and EuroGarages, the first service area in the UK was at Watford Gap on the M1, which opened with the motorway on 2 November 1959. As more service stations opened, the number of operating companies increased, such as Blue Boar, Kenning Motor Group, Take a Break, through acquisitions and mergers there are now only four major operators, which has led to concerns about these companies having an oligopoly. In an attempt to break this monopoly, the government proposed allowing mobile fast food vans to operate at the areas, in 2007 an AA survey concluded that service areas had improved in the previous three years, but cleanliness and pricing were still major issues. Despite concerns of residents, Beaconsfield on the M40 opened on 17 March 2009. Following a public consultation in 2007/8, the Department for Transport/Highways Agency announced that new services should be located at on-line sites, the siting of motorway service areas can be contentious, leading to protracted public inquiries, and often vociferous local campaigns against proposed schemes. Food and fuel sold at motorway services are notoriously expensive and this is often attributed to the many regulations that apply to the areas, and the consequent need to make enough profit from sales to cover the cost of running the service station. In other countries, the authority responsible for the highway tends to subsidise these costs on the grounds that these areas are partly a public service to drivers. The leases provide that motorway services must operate 24 hours a day, with very few customers in the early morning, they need to earn the money in other ways. Under the terms of the leases, motorway services must provide free parking, free 24-hour toilet facilities. However, in 2006 it changed its mind, and the Roads Act 2007 makes provision for a Motorway Service Area Scheme to be made for proposed motorway service areas, the NRA held a competition to determine an operator for the first round of service areas to be opened. Superstop, a consortium consisting of Petrogas and Tedcastles Oil Products, the first service area, Lusk services, opened on the M1 on 8 September 2010. A46 near Woolley and Swainswick. Enderby is twinned with Le Haillan. Corn Exchange, Market Square, Kettering, 1853 by E. F. Law. The upper floor was designed as a Town Hall. In use October 2012 as fitness centre and betting shop. The building is not listed. The pedestrianised section of Humberstone Gate. The Haymarket Shopping Centre is to the left. Leicester International Hotel, with the Cardinal Telephone Exchange tower on the left. Statue of Liberty on the Île aux Cygnes, River Seine in Paris. Given to the city in 1889, it faces southwest, downriver along the Seine. De Lucht Rest Area on the Dutch A2. Many British MSAs at an on-line site have a layout similar to this one though on a larger scale.